Let Earth Clinic community members offer you healthy recipes you can make from scratch at home! Control the ingredients so that they are all-natural or even organic! Turn your health and your life around by giving your body the natural foods it craves (while still pleasing your palate and not spending hours in the kitchen!). So much of what is available in stores today is prepackaged food. This food is often highly processed and full of artificial and even toxic ingredients. It is easy to spend a lot of money on food that isn’t providing much nutrition, let alone taste! Homemade still and always is the healthiest! Get the satisfaction and assurance of making your own meals and home remedies with the following healthy recipes. Edible flowers, spinach and strawberries are combined to make a beautiful and nutritious salad. Spinach for strength, strawberries for glowing skin and edible flowers for joy and beauty! Briskly whisk dressing ingredients together. Toss spinach, strawberries and dressing together in a large salad bowl. Add optional ingredients. Garnish with edible flowers. This salad will give all of your senses a smile! Healthy Recipes! Find healthy recipes for not only hummus, gravy, soups, eggs, and more but also for your own homemade beauty products and therapeutic concoctions! Do you have a Favorite healthy recipe? We would love to hear from you! I totally forgot about this Mexican drink this great tea my mom used to make it for me when I was a young girl. It always made me feel good. It also has many benefits. Hope it helps you in many ways!!! Preparation The first thing to do to prepare this slimming drink is to put the oatmeal in a bowl of water and let it soak all night. The next day you should strain to reserve only oats and then rinse to remove enzyme inhibitors or anti-nutritive substances that are released during soaking. Then drain oats and place in a blender. Add honey, cinnamon and vanilla essence. Mix well until obtaining a homogeneous consistency Finally place in a jar with airtight seal and store in the refrigerator. Good to help you sleep. Helps to fight against hypertension and hypercholesterolemia. Reduces the risk of cardiovascular disease. As you can see this drink is very beneficial for health. Thanks for sharing this wonderful Mexican recipe! I am a big fan of oats! When you say whole oats, do you mean the small dried oat groat? Not the larger flakes, correct? I am sorry Mama I always leave out something. The Oats I use are the old fashioned whole grain rolled oats. I use Quaker! Hope you love it. I do! Question: Feeling a little lost here, I assume the 7C water are for soaking, if so, do you mix any water into the homogeneous mixture to make it a drink or just drink it in its pasty form…also, can you give an idea as to the quantity of honey…thankyou! Hi Jennifer. Yes, they are for soaking and then you give the oats a rinse after you strain them. Most likely I would not soak them again. I would add a 6-8 ounces of water to make this tea, then add sugar and cinnamon into it warm it up and drink! Put as much honey as you want to taste. I use very little because I am prediabetic. Hope it makes sense now. Good luck and I hope you enjoy it. Put the liter of water in a saucepan and bring to a boil. When it begins to boil add the 1 tbsp of oats or more if you like, (if you use more oats it will be more like cereal) and let boil for 3 minutes. After this time turn off the heat, cover and let rest for 2 minutes. Strain the resulting drink with the help of a sieve then add sugar or honey as you like and a tsp of cinnamon. Enjoy. I made your oatmeal tea today! It is cozy and delicious! I have made this recipe a few times this week. Adults and teens in my house who like spicy foods like this, and so does my 9 year old. 6 year old says it is way too spicy! This smoothie is great for colds, coughs, sinus congestion, the flu etc. It is quite hearty but not heavy. The coconut allows for creaminess without dairy, which is helpful when dealing with any congestion. This makes about a quart. It will keep in the refrigerator for 24 hours. Love your word play on Pina Colada – Pina Kill Lotta! I bet it does kill a lotta bad stuff in our bodies … Excellent post, as always – thank you Mama to Many! Heat first seven ingredients in a saucepan until it begins to thicken. Stir often. Mix together noodles, sauce, chopped peanuts, chicken and any desired optional ingredients. The sauce alone makes a delicious dip or topping for raw or lightly steamed veggies. Here you go! They take a long list of ingredients but were quick to make. I will wrap them individually and freeze them. Mix together the wet ingredients in one bowl and dry ingredients in the other. Mix all together with a wooden spoon. Shape into 16 cookies. Bake at 325* for about 10-11 minutes. Do not overbake. These are a bit crumbly but not too much. OMG Mama these cookies are so healthy. My aging Dad needs one or two of these daily but eats the otc not-so-healthy from the grocer. Gosh if you could sell & ship these you might make a small fortune. How long of a shelf-life is the big question. So many seniors need that coconut oil and all the other superfoods in there. 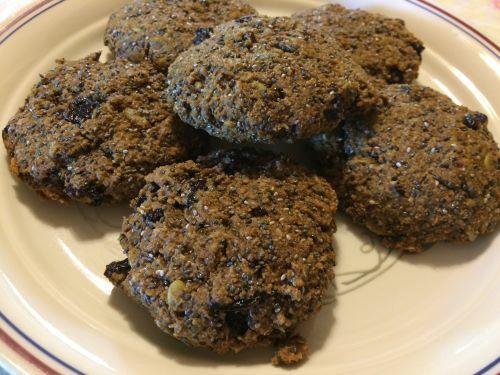 Black Walnut may also go good in that recipe as they too are loaded with Omega 3's as well as preformed Glutathione. My son is lactose intolerant along with having crohn's disease. I make this non-dairy butter for him and he loves it. I thought I should share with everyone on Earth Clinic. I hope it will be helpful to those in need. 1 & 1/2 cups melted extra virgin organic coconut oil. 1/2 cup any non-dairy milk (I use almond milk). 1/4 cup canola or olive oil. Whip in a blender for 1 minute. Pour in a plastic container and refrigerate. It's like a multivitamin in a bowl, which is great, but I wondered if in my case, it might be too much of a good thing? I'm 56 and long past menopause and wondered if all of the iron in my huge bowls of Swiss Chard every day might actually be detrimental? Looking forward to your wisdom. Thanks! Kelly, I have no answer for you, but I surely would like your recipe!! I’d love Swiss Chard recipe, please. Kelly: A green smoothie with any blender is required because the nutrients are locked up in the cellulose. Fermentation neutralizes the goitrogens. A wealthy man recovered from deaths door because baby leaves have growth factors, steroids, and hormones not in mature leaves. Hi Om, Theresa and Noelle. I'm more than happy to share the recipe, but bear with me as it wasn't one that came from a book with specific instructions and ingredient amounts. I watched an Italian friend make it and pretty much winged it, so the measurements are approximate. Clean all of the greens and separate the stalks from the leaves. Chop the stalks into 1-2" pieces. In a large skillet, add olive oil, onion, garlic, shredded carrot and a couple of cups of the chopped Chinese celery stalks. Cook them over medium heat until all are tender. Add the tomato paste and incorporate into the oil. Add more olive oil if necessary as you don't want a dry mixture, you want it to be almost like a sauce. Set aside. In a soup pot, add water and bouillon paste. Add chopped stalks from chard and what's remaining of Chinese celery. Don't boil – just let them cook on a high simmer. When almost tender, add red potatoes (first), then chard and leaves from celery. Cover and keep at high simmer until all greens are wilted. About halfway through the process, I usually use thongs to pull up some of the cooked greens from the bottom of the pot to the top so that the top greens cook well. When the greens are wilted and the potatoes are fork tender, add the onion, garlic, tomato paste (etc.) mixture to the greens and stir well. If the mixture dried up a bit while sitting, add more olive oil to it before adding to greens. Again, you want a sauce-like texture. Add the Cannellini beans. Simmer for approximately 15 min's. If you prefer a soup-like texture, you're done! If you prefer a thicker texture with less liquid, like I do – sprinkle the cornmeal as you stir (otherwise, it will clump) until it's nice and thick. The dish is best if you let it sit a couple hours before eating it. It gives the tomato, garlic, onions and oil time to incorporate in to the potato and beans. And the next day, it is even yummier. He – I am getting a bit uneasy about Thongs?? They are kitchen tongs. I hope I am spelling it right. Bean soup made with a large ham bone boiled in it with the beans. You could try chicken soup with the bones boiled in it, too. It’s particularly good with a little cayenne pepper or jalepenos in it. Some people say put a little vinegar in the water to help get the minerals out of the bones. Ok this my new recipe for cold, congestion, sinus, immunity and digestion. The first part of the recipe is from South Indian cuisine and the final addition is from Japanese Cuisine. So I named it INDO JAPANESE MISO SOUP. I prefer Red Miso, as it has fermented Soy and Brown Rice. Brown Rice has richer amino acid profile. 2. Then add Tomato, garlic, pepper powder, turmeric powder and chilli powder. 3. Boil it in medium heat for 10 mins. 4. Switch off the heat. 5. After 2 mins or when the soup heat starts to decrease. Add 1 table spoon of red miso paste and mix it well. no need to add salt as miso has salt. Now delicious Indo Japanese Miso soup is ready. Don’t add miso in boiling soup, it will kill the good bacteria and yeasts. For those craving more garlic in their diets, a friend of mine recently sent me a recipe from England for Roasted Tomato and Garlic soup that I have used over and over in various dishes, like lentils and pasta, with slight ingredient variations. This is such a delicious recipe, let me tell you! The soup is yummy, but I did found it quite acidic, so be forewarned if you suffer from acid reflux. Better if you only use half a head of garlic rather than the entire head as the recipe states. Please let me know if you make it and come up with any additional creative variations! Heat the oven 375 degrees. Place the tomatoes, garlic, onions and thyme into a large roasting tin and season, to taste, with salt and freshly ground black pepper. Drizzle with the oil, and roast in the oven for 40-50 minutes. Remove from the oven and set aside to cool slightly. Mash the garlic with the back of a fork, and discard the skin. Tip the roasted tomatoes and onions into a food processor along with the mashed garlic, and pulse until smooth. If the soup is too thick, pour into a large saucepan and loosen the mixture with either vegetable stock, or single cream. Add balsamic vinegar, to season, if you like. Using the above but blending just half a head of the peeled and roasted garlic, I pulsed the ingredients in the blender and then stirred half the recipe into two cups of cooked red lentils. Add more of the sauce if you want lentil soup. I substituted dried oregano for fresh thyme during the roasting process. I did NOT use any of the optional ingredients. I then pulsed the ingredients in a food processor and added about 1/8 teaspoon of cayenne and some fresh basil. I also used a teaspoon of honey instead of caster sugar. Most delicious pasta sauce ever!! I served it over rice pasta. The above 3 recipes taste better the second day, but who can wait! Get ready for a most delicious, lingering aroma while the tomatoes and garlic are roasting in the oven! A hint of butter added the soup/sauce right before serving brings out the flavor. -onto a toasted slice, spread a generous amount of coconut or Olive oil. -then press 1 or 2 cloves of garlic, mash evenly. -next sprinkle a tsp of Matcha powder. (whole leaf green tea powder) you should be able to purchase at a local health store or online. -cover with a spread of honey and cinnamon. Mash out evenly with a fork, it will become a dark paste. & enjoy.. The garlic, honey, and green tea powder act as powerful anti-virals… Plus I find it quite tasty. Make a batch of scrambled eggs and add a heaping teaspoon of basil and a teaspoon or so of turmeric. Add some (real) cheese. My Mom made what she called a healthy gravy by letting any fat or residue left in a pot or pan reduce to just prior to burning then add a tablespoon or two of water and stir. This gave you use of the leftover nutrients without any E no's added. I usually do it but add milk instead of water cos I prefer white sauces. If I want to make a fancy sauce I add the herbs as necessary. You can learn which herbs to use by reading the ingredients on the back of the packets at the supermarket. I get annoyed when I see "Herb mix" printed on them because then I can't copy it.